MovieSherlock lets you to download videos fast, smoothly and no quality loss whats so ever! 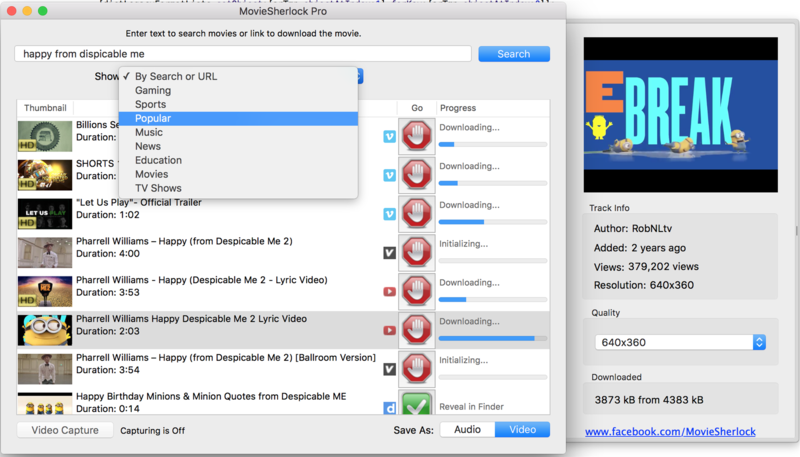 MovieSherlock is just the best way to get videos to your Mac. Save as MP4 and MP3: downloaded videos will be automatically converted. Fast download: 15x faster than real time! iTunes integration: Add to iTunes feature allows to copy downloaded video and music to any of your devices such as iPhone, iPad, iPod, etc. Download video with subtitles from YouTube and DailyMotion. Correct file naming: The downloaded videos will retain the original names from the source web-pages. Native video format: If you get the video with MovieSherlock, be sure you can play it. Simultaneous download: Get so many files you need at one time.